Here is another photo up for grabs, asking what is it? Any ideas…. Recessed rounded cement brick stone wall. This looks like base-level stonework either on the side of a building or on a stonewall. 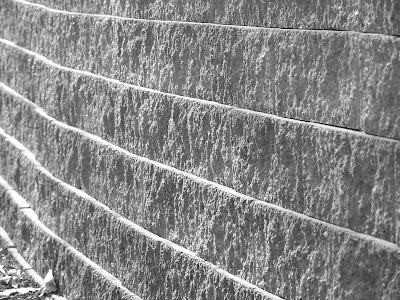 Stone on something verticle, at any rate. I thought it was a pretty cool photo, with the lines and all. But I can’t stump you both!